If using fresh duck breasts, score the fat of the duck breasts. Fry in a deep, round skillet on both sides until well browned. If using the duck confit, remove from tin and scrape off the skin and fat. Cut the meat away from the bones and chop up. Peel, core, quarter the apples. Fry the apples in batches, 2 at a time for about 5 minutes until slightly soft and golden and on both sides. Place the fried apples on a dish. Cut the pastry to fit across the top of the skillett with a bit extra over the side, place in fridge until needed. Once all the apples have been fried, drain off the excess fat. Add the vinegar and honey to the pan and stir into any residual fat. Over a low heat, layer the apples across the entire base of the skillet in concentric circles, the base needs to be covered. Sprinkle salt and freshly ground black pepper over the apples. Important note – Turn the overhead extractor fan off if it is running. 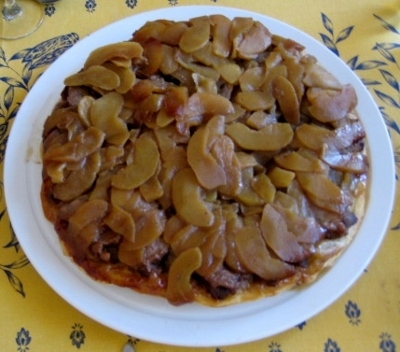 Pour a large tablespoon of Calvados over the apples and light it straight away. Make sure you stand back . Take the pastry circle and place flat over the duck, press down with fingers all around the edge of the skillett to try and seal in the flavour. Prick the pastry all over with a fork. Put into the upper- middle part of the oven straight away. Cook for about 10 minutes then lower heat to 180 C degrees for 20 minutes until cooked through and the pastry is golden. Place a large plate across the whole of the top of the skillett. Use kitchen gloves to protect your hands. Carefully and quickly turn the skillet and plate upside down so that the pastry is now sitting on the plate and the apple is uppermost. 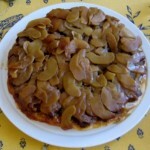 Use a knife to carefully remove any apple slices stuck to the skillett and place them on top of the tarte.